The Space Based Space Surveillance mission streaked into a sun-synchronous orbit 336 miles above the planet following a successful boost provided by the Minotaur 4 rocket. 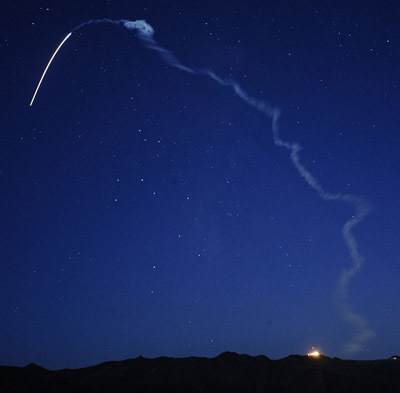 Blasting away from Space Launch Complex 8 on the southern end of Vandenberg Air Force Base, Calif., the 15-minute ascent began as scheduled at 9:41 p.m. PDT (12:41 a.m. EDT). The initial three-and-a-half minutes of flight were powered by left-over motor stages from decommissioned Peacekeeper intercontinental ballistic missiles. The three stages propelled the SBSS satellite into a suborbital arc while traveling southward over the Pacific Ocean. A commercial Orion 38 solid-fuel motor serving at the Minotaur's fourth stage then delivered the necessary kick to inject the 2,275-pound satellite into the planned circular orbit. It marked a flawless maiden mission for the Minotaur 4 in its satellite-launching configuration, giving the Air Force a new proven rocket to launch mid-sized cargos weighing as much as two tons. Orbital Sciences Corp. oversees the Minotaur rocket program for the military, now having conducted 18 launches successfully to date. Many of those previous flights were Minotaur 1 rockets, which utilize Minuteman missile stages to loft half-ton payloads. Other Minotaur versions that have flown were suborbital vehicles. The star of Saturday's show was SBSS, the satellite observatory at the heart of a $858 million project that promises dramatic improvements in the military's ability to identify and track items in orbit. "SBSS will help make our space assets safer and more secure, keeping America at the forefront of space," says Col. J.R. Jordan, SBSS mission director. "This satellite is going to revolutionize the way we track objects in space by not being constrained by weather, the atmosphere or the time of day. This capability will be essential to our space situational awareness architecture for the near future and beyond." Equipped with an 11.8-inch telescope and 2.4 megapixel focal plane, the craft will use its optical eyes to image the sky and provide analysts the data they need to keep better tabs on space debris and guard against accidental collisions. What's more, the reconnaissance provided by SBSS will watch for potential risks posed to the military's communications, navigation, weather and spy satellites by enemy interference. "Every day, threats to our nation's valuable satellites and space platforms are growing," Jordan said. "SBSS will revolutionize our ability to find and monitor objects that could harm the space assets we depend on for security, communications, weather forecasting and many other essential services." Accidental smashups, such as last year's crash between an Iridium telephone bird and a defunct Russian craft, or the earlier Chinese anti-satellite test that destroyed a spacecraft illustrate how Earth orbit has become a contested environment. Enhancing situational awareness in space has become a major objective for the military. Putting a satellite into orbit to scan the sky will narrow gaps in ground-based space tracking that is limited by geographic locations, nighttime viewing and clouds. "Space situational awareness is an essential component to maintaining space superiority. The benefits that SBSS brings is that by operating solely in space the SBSS satellite will circumvent the current terrestrial restrictions and limitations of weather, Earth line-of-sight and nighttime-only operations. This capability that SBSS will deliver will triple the probability of event detection, double the sensitivity and increase capacity by 10 times," said Lt. Col. Robert Erickson, SBSS Space Situational Awareness Squadron commander. The Boeing Co. leads the SBSS project and Ball Aerospace built the satellite based on the BCP-2000 bus. A pair of solar wings feed the craft's electricity needs, a two-axis gimbal enables rapid pointing of the optics and the onboard computer can be reprogrammed with updates. "The big advantage from a design perspective of SBSS is by having the camera on a two-axis gimbal we can very rapidly point and take pictures of the sky where we like. That agility is very important," said Todd Citron, Boeing's director of advanced space and intelligence systems. "The onboard computer that Boeing supplies we can upload new algorithms over time and continue to improve the performance on-orbit." Early on-orbit testing and commissioning activities for SBSS will last several months. Also, maneuvers are planned to raise the orbit by more than 50 miles to the intended operational perch. 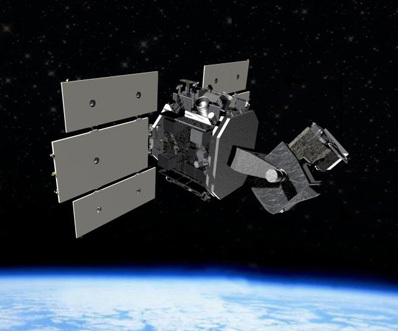 Acceptance of the satellite into full service is slated to occur by next spring. So how exactly does the SBSS observing process work? "The system receives tasking from the Joint Space Operations Center. It takes that tasking and converts it into commands that go up to the spacecraft. This satellite has a digital camera that's on a two-axis gimbal. So the commands sent up to the satellite basically tell the satellite where to point the camera and to take a picture. That data then is downlinked to a ground site," Citron said. "That information could either be what's referred to as metric data -- basically positional information on the objects we're viewing that would allow one to compute orbits, or also it could be what's called space object identification, or SOI, information which one could use to perhaps get a sense of what kind of object one is looking at." However, officials won't say exactly what size objects SBSS can see. "We will say there are a lot of objects up there that we've lost track on and there are a lot of objects that we think we'll be able to observe that we haven't been able to observe previously. We're going to improve that database and actual tracking on a daily basis," Jordan said. Many thousands of objects are routinely tracked by the military today using ground-based radars and telescopes. But there's vastly more bits and pieces of space junk circling the planet not being watched that could damage spacecraft that are woven into daily life, such as commercial television satellites. "I think it's clear that our country is very dependent on space," Citron said. "To the person on the street this is a critical element of ensuring that things essential to our economy and our health as a nation continue." And even the military's Global Positioning System constellation of satellites has become an intergal part of everyday civilian life. "Just about everything you do is synchronized to GPS time, from your banking transactions or point-of-sale purchases with your credit card and so forth. If that capability went away, it would have a tremendous impact on the economy," Citron said. "So our economy and our military are very dependent on space, which makes it a potential target for adversaries. Understanding what's going on in space is very important...That's the motivation for space situational awareness." The SBSS has a seven-year design life, and additional surveillance satellites could be envisioned to further improve the observing capacity. "The Air Force, in general, is pursuing what the longterm architecture should be for space situational awareness. We've been doing our own studies of architectures and when you look at various tradeoffs in terms of the constellation we certainly see advantages to having more than one satellite up there," Citron said.